When Edward AtLee Barber, the foremost American ceramic historian of the late nineteenth century, wrote that the vases designed by Edward Lycett and made by the Faience Manufacturing Company of Greenpoint, Brooklyn, “surpassed everything previously produced in this country,” it represented more than just praise for FMCo, as it is known today; it served as acknowledgement that the American ceramics industry itself had finally come of age. Up until the mid-1870s, American ceramic manufacturers had lagged behind their European competitors. 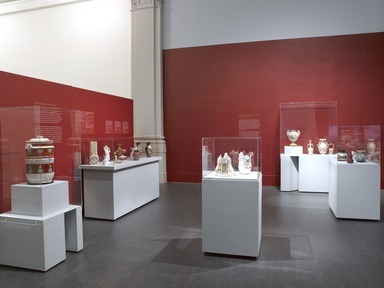 The finest ceramics sold in the United States came from abroad—a fact made painfully clear when American ceramics were displayed alongside European wares at the Centennial Exhibition in Philadelphia in 1876. To close this gap, American manufacturers began luring European-trained ceramicists with promises of higher salaries, a shorter workweek, and modern, up-to-date factories. It was in this spirit in 1884 that FMCo hired the Englishman Lycett as artistic director to reinvigorate its line. Lycett applied the skill and refinement of his Old World training to the New World’s booming economy and unprecedentedly huge market, creating wares of amazing scale and flamboyant decoration that echoed the American character and announced a vigorous new phase of design, manufacturing, and consumerism. He produced exotic, highly original designs in the then new Aesthetic Movement style, which synthesized Japanese, Chinese, and Near Eastern influences. He also introduced new formulas for clay bodies and glazes and progressive procedures such as using interchangeable parts and decorating the same forms with varying designs to increase consumer choice. This exhibition, the first ever to focus on Lycett and FMCo, features some of the finest wares they ever produced. 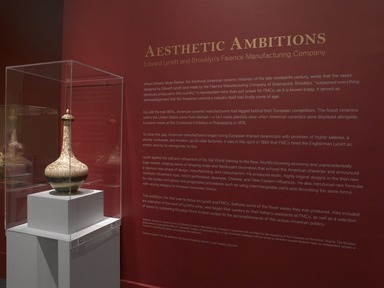 Also included are examples of the work of Lycett’s sons, who began their careers as their father’s assistants at FMCo, as well as a selection of wares by competing Brooklyn firms to lend context to the accomplishments of this unique American pottery. In the mid-nineteenth century, as Manhattan became more populous and fear of fires grew, restrictions on industry slowly forced manufacturers, especially those requiring furnaces, such as glass and ceramic makers, off the island. Both New Jersey and Brooklyn, in particular Greenpoint, became convenient locations for these industries. Although no potteries survive in Greenpoint today, at the height of the ceramic industry in Brooklyn in the last quarter of the nineteenth century there were a dozen firms in the neighborhood. From the 1850s until their demise in the late 1920s, many of the Greenpoint pottery firms produced art pottery and tableware for domestic and commercial hotel and restaurant use as well as more utilitarian objects such as buttons and household articles. Firms that diversified in this manner assured their financial success and longevity. Born in Newcastle-under-Lyme in Staffordshire, England, Edward Lycett began his career as a china decorator as a twelve-year-old apprentice to Copeland and Garrett, the former Spode manufactory, in Stoke-upon-Trent. At nineteen he worked in London at Thomas Battam, Sr.’s century-old china-decorating establishment. Lycett immigrated to New York City in 1861 as one of hundreds of ambitious Englishmen from the Staffordshire potteries in search of greater prospects and higher wages. In 1866, E. V. Haughwout and Company, a prestigious New York ceramic and glass retailer, commissioned him to paint additional pieces of the Lincoln administration’s porcelain dinner service for President Andrew Johnson. During the next eighteen years, Lycett would work both alone and in partnership. He and his employees worked in a variety of styles over a broad economic range. For large retailers, they decorated imported European porcelain blanks, furniture mounts, and more utilitarian articles such as bar pitchers and sink basins. It was common practice in the American ceramics industry in the late nineteenth century for potters to join forces with financial backers to start up a business, and it is likely that an entrepreneurial potter joined forces with Bernard Veit, a partner in the prosperous millinery goods manufacturer and importer Veit and Nelson, to establish FMCo in February 1881. The business was virtually a family affair: Veit appointed his son-in-law, Joseph Baruch, a former glove manufacturer, secretary and treasurer, and Veit’s brother and sons were among the directors. The firm produced ornamental, white-bodied earthenwares in their Brooklyn factory and maintained retail showrooms in lower Manhattan. Fashionable French faience ceramics and Limoges wares, both much admired at the United States Centennial Exhibition in Philadelphia in 1876, undoubtedly inspired the name of the company and served as models for the firm’s early wares. In 1884, FMCo underwent a dramatic transformation that attests to its ambition to succeed at art pottery production. The firm expanded its Brooklyn pottery-making facilities, moved its Manhattan showrooms to a new location, and recruited Edward Lycett, a renowned ceramic artist, as its new art director. Within two years of his arrival, Lycett had transformed FMCo’s artistic agenda. 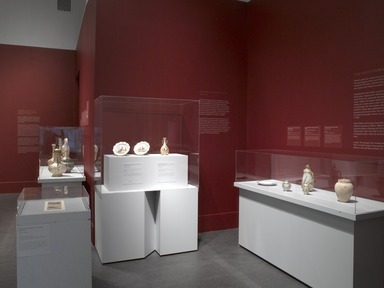 He experimented with techniques that enabled the firm to produce a wide range of refined ceramic bodies, and he developed bold and eclectic designs that drew inspiration from fashionable English and European wares as well as from venerated ancient, medieval, and Renaissance objects in major museum collections. More than fifty large-scale shapes of Near and Far Eastern derivation, embellished with exotic motifs in vivid enamels enriched with raised gold paste as well as jeweled and luster decoration, have been identified and became hallmarks of the firm. The company promoted its stylish new wares in trade publications oriented towards jewelry and fancy goods wholesalers as well as in periodicals aimed at elite consumers. Positive press helped to accelerate the firm’s success, and FMCo was soon retailed at all the major art goods establishments from New York City to San Francisco, including Tiffany & Company of New York. Despite the great beauty of FMCo’s wares, the firm’s focus on art pottery proved to be its downfall. Producing ornamental wares without a commercial line of goods to offset the expense as other Greenpoint potteries did forced it to cease production in 1890 and reorganize as agents for a French porcelain manufacturer. In 1890, at the age of fifty-seven, Edward Lycett moved with his wife to Atlanta to live with their eldest son, William, who had established a china-painting business there. In semiretirement during the late 1890s, Lycett decorated French and German porcelain blanks for his son’s business as well as for personal enjoyment. Working in the French revival styles typical of the Beaux-Arts period of the 1890s, he returned to the detailed naturalistic and classical decoration characteristic of his work in the 1870s. During this time, Lycett also conducted experiments with different types of surface decoration, including the luster glaze found on Middle Eastern tiles. His efforts to exhibit his specimens and to contact museums in the United States and England about his experiments reveal his belief in his discoveries, as well as his desire to secure recognition for his work. 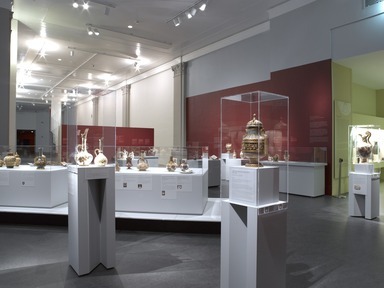 Eventually, the Smithsonian Institution in Washington, D.C., acknowledged his accomplishments and acquired examples of these experimental pieces. Edward Lycett was married twice and had four children. His only daughter, Emily Lycett McElraevy, married and remained in Brooklyn, while his three sons, William, Francis, and Joseph, each forged successful china-painting careers. Apprenticed to their father, Lycett’s sons became adept in the latest styles, ranging from meticulously painted naturalistic motifs to the rich, gold paste decoration seen on FMCo’s wares. William, the eldest, studied and eventually taught classes at Cooper Union in New York before joining his father in partnership with china painter George Warrin between 1877 and 1879. William later established his own china-painting business and school in New York, which he expanded, with the help of his brother Francis, to a second location in Atlanta in 1883. After William and Francis closed the New York branch of William’s business in 1885 or 1886 Francis presumably joined his father in Brooklyn at FMCo. He later moved to Westchester, New York, then to Connecticut, and eventually to Massachusetts, where he continued to work as a china artist. Joseph, the youngest son, worked alongside his father at FMCo. He later taught china painting to ladies in Kansas City, Missouri, and ultimately settled in St. Louis. 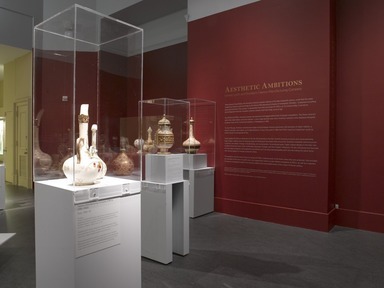 February 1, 2012 Nearly forty decorative arts objects, including vases, ewers, plates, and other wares, drawn from public and private collections, will be on display at the Brooklyn Museum in the exhibition Aesthetic Ambitions: Edward Lycett and Brooklyn’s Faience Manufacturing Company. 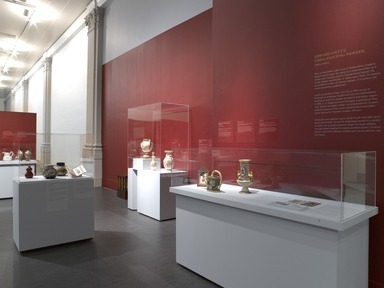 The exhibition highlights the nearly fifty-year career of ceramicist Edward Lycett (American 1833–1910), creative director of the Faience Manufacturing Company from 1884 to 1890. The range of works illustrates Lycett’s talent and his adaptability to stylistic changes in the late nineteenth and early twentieth centuries, as well as his vision for Faience, a company based in Greenpoint, Brooklyn, that earned acclaim for producing ornamental wares that set a new standard of excellence in American ceramics. These bold and eclectic pieces synthesized Japanese, Chinese, and Islamic influences characteristic of the Aesthetic movement and were sold in the United States’ foremost artware emporiums. 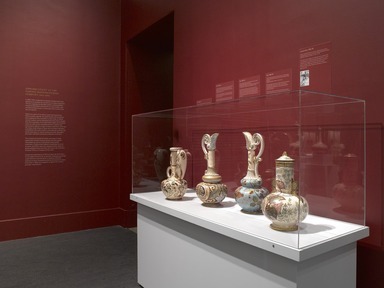 Among the ceramics on view are 39 Faience pieces, including a number of large-scale vases. 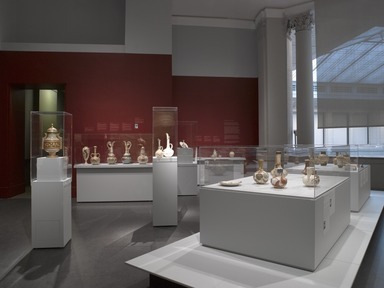 Also included in the exhibition are Lycett’s formula books, family photographs, and other ephemera; rare examples of ceramic works by his three sons; and other Brooklyn-made ceramics from the Museum’s collection. Edward Lycett immigrated to New York City in 1861. His early career included a White House commission to paint additional pieces of the Lincoln administration’s porcelain dinner service for President Andrew Johnson. In 1884, Lycett began his employment with the Faience Manufacturing Company, where he experimented with ceramic bodies and glazes and designed opulent wares. He supervised a team of talented artists, including James Callowhill (1838–1917) of the English firm Worcester Royal Porcelain, who decorated the vessels with exotic motifs in vibrant hues and costly gold paste. Lycett and his team of decorators produced pieces that were sold in the foremost jewelry and china shops throughout the United States, including Tiffany & Company in New York and Bailey, Banks, and Biddle in Philadelphia. 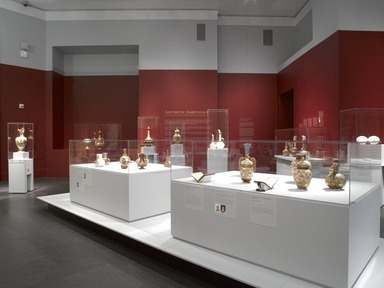 The exhibition is organized and circulated by the University of Richmond Museums, Virginia. The Brooklyn presentation is coordinated by Barry R. Harwood, Curator of Decorative Arts. A fully illustrated catalogue with an essay by the exhibition’s curator, Barbara Veith, an independent scholar of American ceramics and glass, accompanies the exhibition. F. K. M. Kropp; William Boch & Bros.
Royal Crown Derby Porcelain Co.